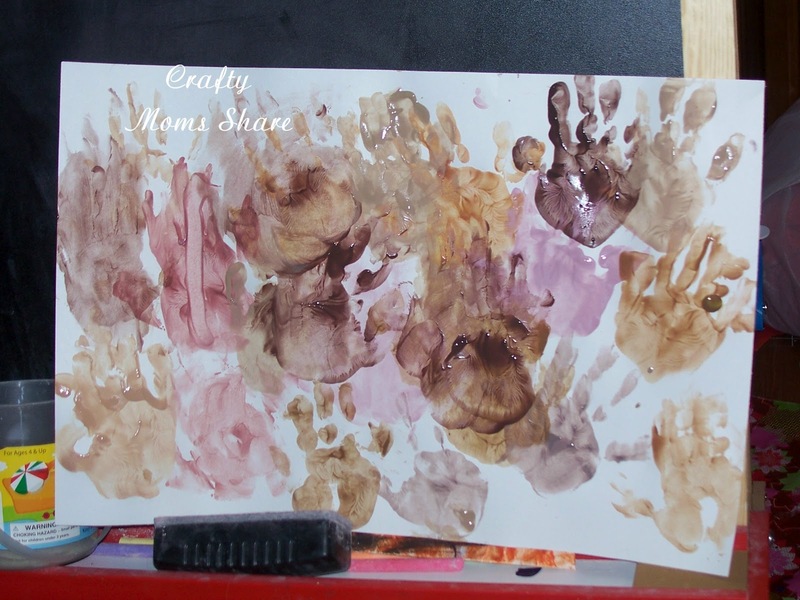 Just a quick reminder that Sharing Saturday and Homemade Mother's Day Gift link parties are still open. Please come linkup with your child-oriented crafts and activities and your great Mother's Day ideas! And of course visit to check out all the wonderful ideas already shared!! 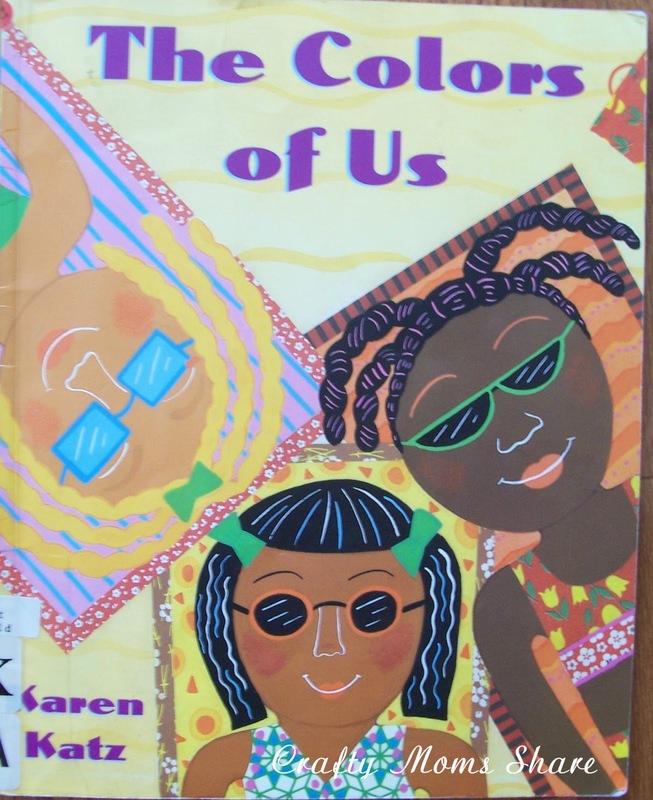 So the book with project is The Colors of Us by Karen Katz. 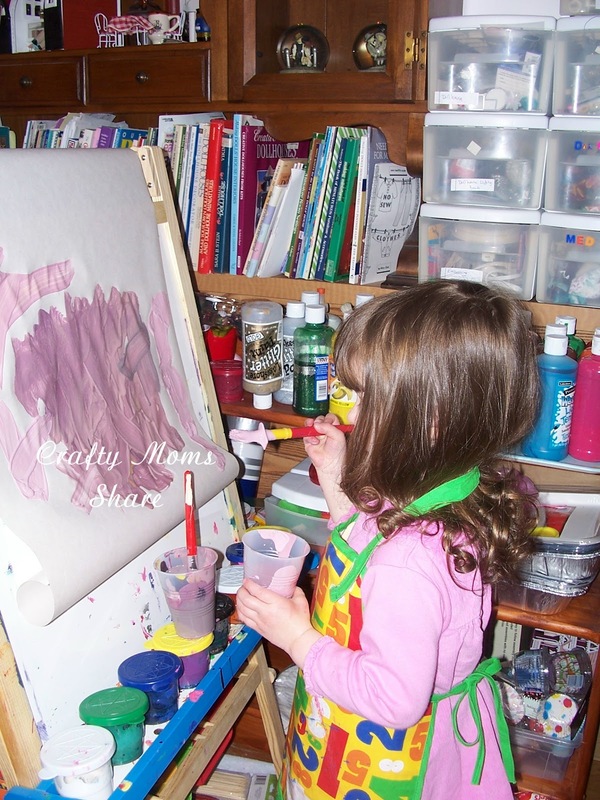 This story is about a girl whose mother is an artist and tells her that if she mixes red, yellow, black and white paints in the correct proportion she will get the right shade of brown as her skin. The girl says, but brown is brown. Then they go for a walk and see many different shades of brown in her friends, neighbors and family's skin tones. 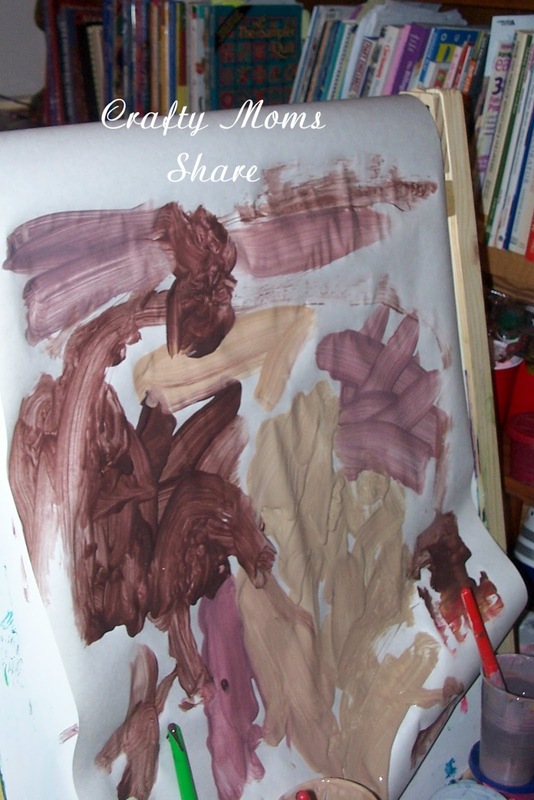 It is really a lovely story about the different shades of our skins and of course it lends itself to making different shades of skin colors from paint, which is what we did. We mixed red, black, yellow and white to get different shades that could be skin tones. It took some trial and error (and didn't help that we were almost out of red paint). We slowly got some good colors. We tend to have a lot of pink since we were trying to get Hazel's skin tone. Then we expanded out to get more shades. Hazel has an Asian friend at school so we tried to get her color and then tried to get some of the colors mentioned in the book. 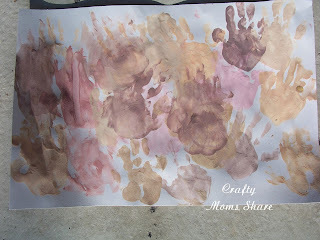 With each color Hazel made handprints on one page, so we would have a sheet with the different shades of skin tones. Another book we have enjoyed is The Other Side by Jacqueline Woodson. This story is told from the point of view of a black girl in the South in a town with a fence dividing the blacks and whites. There is a young white girl who sits on the fence each day of the summer watching the black children play. Eventually the girls talk and start sitting on the fence together. It is a nice story of how even when divided children find a way to play together. Another fun book is The Crayon Box That Talked by Shane Derolf. It is a story told by a child who hears the crayons in a box saying they do not like one another. The child buys the box and takes the crayons home and makes a picture showing each color how they work together to make beautiful pictures and then of course the crayons like one another. It is a very cute way to show liking each other's differences. 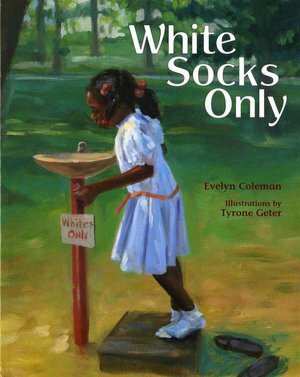 A good book to teach about segregation is White Socks Only by Evelyn Coleman. This is a story that a grandmother tells her young granddaughter about the first time she walked into town by herself. The rule was and is you are only old enough to walk into town by yourself if you are going to do some good. The grandmother as a young girl walked into town with two eggs. She wanted to see if it really got hot enough to fry an egg on cement. After her experiment she saw a water fountain with a sign on it saying "Whites only" and since she knew what that meant, she took off her shoes so she only had her clean white socks on the stool. Of course a white man came and yelled at her and beat her, but many of the black people came and took their shoes off and took a drink as well. I won't ruin the end, but it is a great story about causing a bit of revolution during the time of segregation. Hazel (3) enjoyed this story, but I don't think she really got what was happening and she didn't ask questions, so I didn't take the time at bedtime to explain it. Well that is enough multicultural resources for this week. Hi I am a new follower - hope you will come check out my blog and follow me, too! My children love that book and the project is really pretty special! The Colors of Us...I want this book!! I love the paintings with all the different hand prints too. Such a wonderful idea! Thank you so much for sharing at Teach Me Tuesday!! Love this! Pinned it to the Kid's Co-op board! That sounds a really good book and idea. My son loves mixing colours so shall do this with him. I love this. 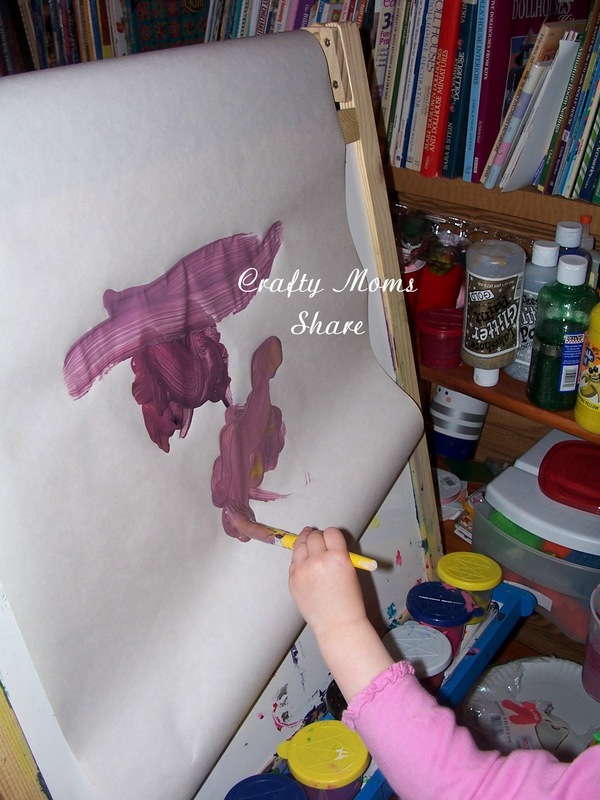 Thank you so much for linking up with Weekly Kid's Co-Op! What a fabulous project! Thanks so much for sharing at Mom On Timeout! That is wonderful! A great way to show how we are all different and all special! What a wonderful way to learn more about how much people are the same despite outward differences! I would love for you to link this post to Read.Explore.Learn on my blog! A Beautiful collection of books and a very fun art project make for the perfect book day. Thanks so much for sharing this post with us and for celebrating Multicultural Children's Book Day. Happy Reading.